Welcome to my blog on St. George Island. Feel free to email me any time! Use the "Find Your Property" tab above to do a search through all properties listed for sale on St. George Island, Apalachicola, Eastpoint, or anywhere within the local MLS. OK, well today is catch-up day for this St. George Island blog. We've had 2 storms in 2 weeks skirt us by. Both passed by well to our south, but sent us high tides and moderate bayside surges. Ike was like a great big old man in a bathtub, displacing so much water in our shallow gulf that it had no choice but to slop up over the rim and fill in all the low places on the bayside of the island. It stayed up for a couple of days, through several high tides and not very low tides, before finally moving on out. On St. George Island's beach side, we lost most of the late season sea turtle nests we had left. 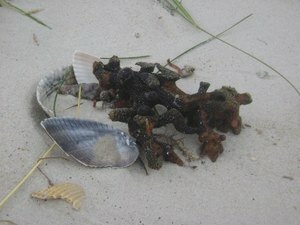 I had 3 left on my mile of beach that were up on the high dunes, and one has since hatched. Two still to go. Dog Island lost all of their remaining late season nests. All in all, we still are having a great year for nesting on St. George Island, and we expect to lose sea turtle nests every year to storm surges and high tides, it's just a matter of when. Late in the season like this is actually not so bad. 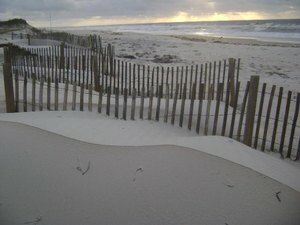 Top: Our mid-beach dunes were scoured down to nothing, taking all the sea turtle nests that were located there, but sand actually piled up against our higher dunes - I thought the line of this new sand dune against the fencing was just mesmerizing. 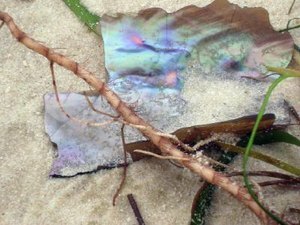 Middle: This irridescent shell was catching the dawn light just right. Wish I were a better photographer.